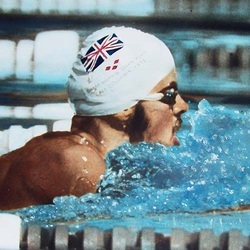 A four time University of Miami All American in swimming (1973-76), Wilkie represented Great Britain in the 1972 and 1976 Olympic Games. His gold medal effort (200 meter breaststroke) in the '76 games marked the first Olympic gold for a British male swimmer since 1908. A silver medalist (200 meter breaststroke) in the 1972 Olympics, Wilkie established three world records before retiring in 1976. At the University of Miami, Wilkie was a three-time NCAA national champion. During his outstanding amateur career, he was nmed European swimmer of the year on three occasions, while also being honored as the Sportsman of the Year in England in 1976.